Our preschoolers adore the old lady books. We’ve read all of Lucille Colandro’s books; we add them to our seasonal literacy centers whenever possible. 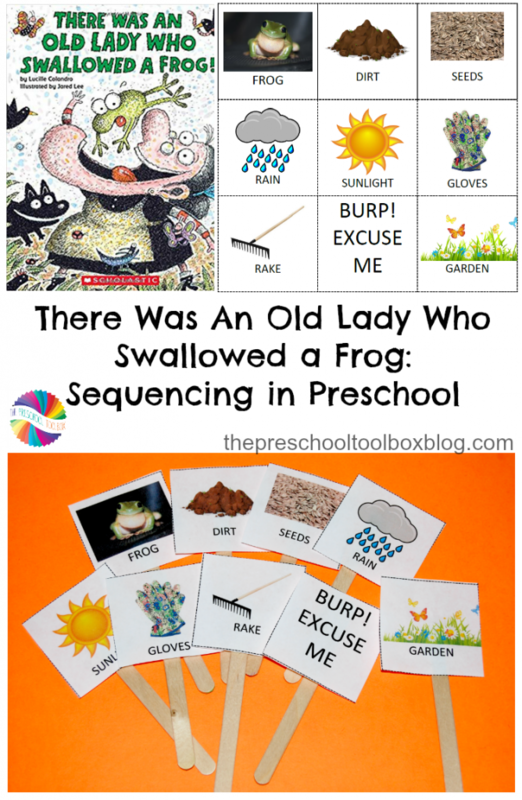 We hope your own preschoolers enjoy There Was An Old Lady Who Swallowed a Frog for sequencing activities at home, in childcare, or in the preschool classroom this spring. One copy of There Was An Old Lady Who Swallowed a Frog by Lucille Colandro. One copy of the FREE Printable Sequencing Cards – available in a download at the bottom of this post. Scissors (Fiskars brand is, by far, the best brand for preschoolers). 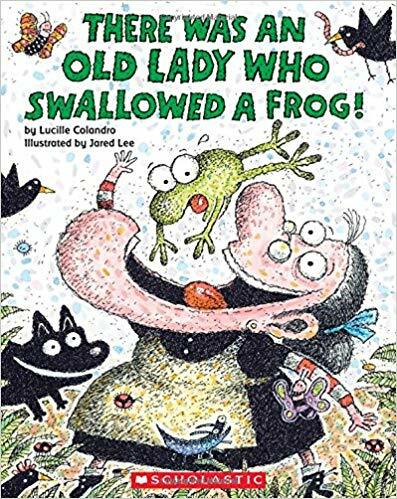 Show your preschoolers the book, There Was An Old Lady Who Swallowed A Frog by Lucille Colandro. Say the name of the author several times and ask your preschoolers to say the author’s name back to you. Practice often so they become familiar with the author’s name over time and begin to make associations as you read more titles from the same author. Look at the book’s cover (front and back). Ask the children what pictures they see on the covers that might help them predict what the story is about. Chart the predictions on a white board or piece of chart paper. Read the book to your preschoolers and ask the following questions when finished. What characters or animals are in the book? What items are in the book? Where does the story take place? What happens at the beginning of the story? How did the story end? While preschoolers may not know the answers after the very first reading, they will catch on as you re-read and look for characters, items, and the setting within the book. Repetition is key to all learning with preschoolers; the more opportunities they have to listen and look at the book, the more learning will stick. Print copies of the sequencing cards for the number of preschoolers in your class, childcare, or at home. Laminate or cover the printable cards with clear contact paper for durability. Kids can cut apart the individual cards (or cut prior to the activity). 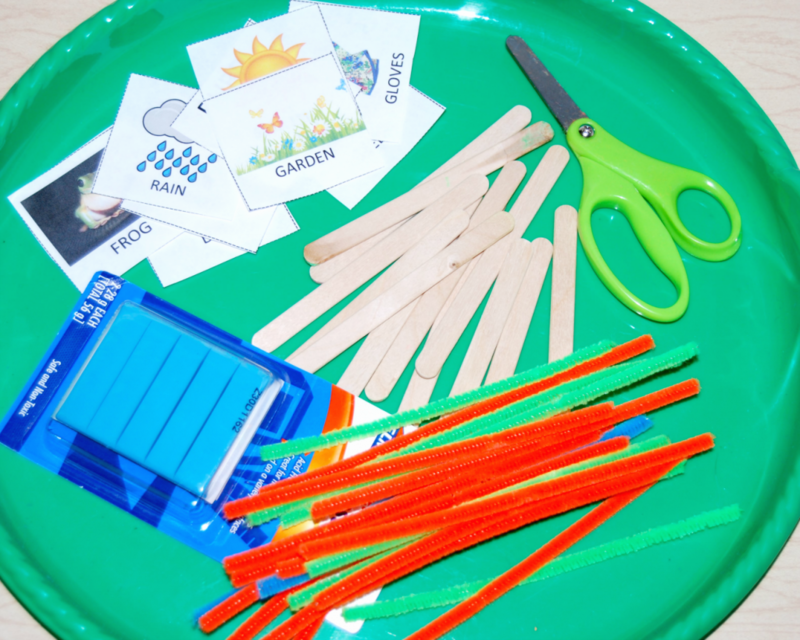 Have the kids use small torn pieces of poster putty (or tape) to adhere each of the sequencing cards to a craft stick, pipe cleaner, or a seasonal paper straw. Use the cards as props for reading the book again. 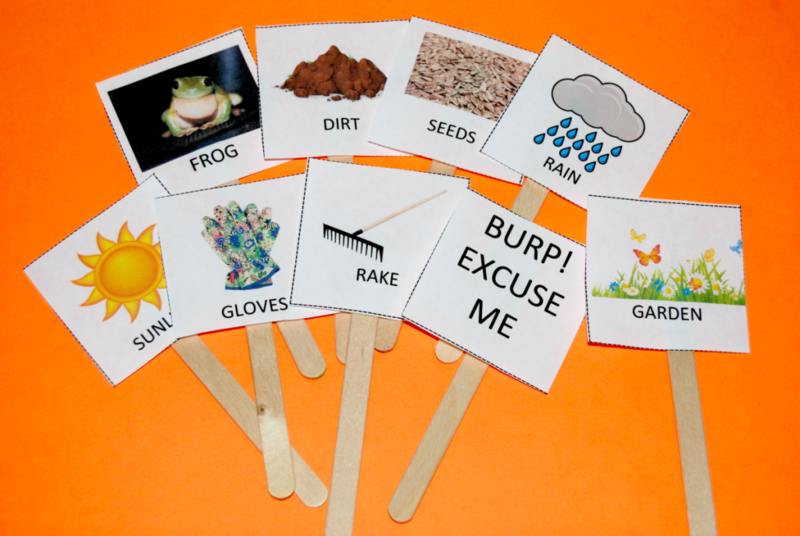 Invite kids to hold up their sequencing props as the items appear in There Was An Old Lady Who Swallowed A Frog. Younger kids may need reminders to look at the item on their prop and listen for when it appears in the story. Make a center with miniature items the kids can use to re-tell the story. 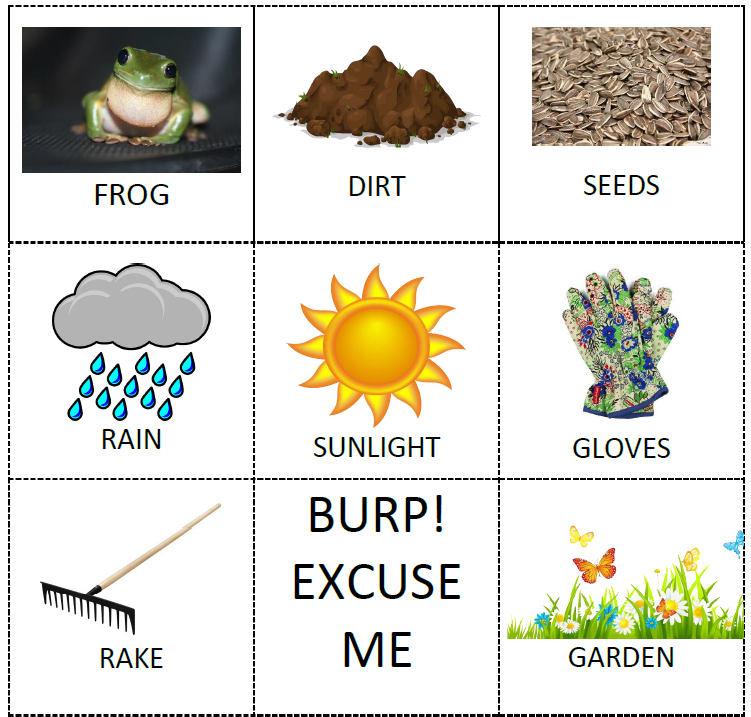 Act out the story by asking your preschoolers to find items from the story at home or in the classroom: a plastic frog, dirt in a bag, flower seeds, water (for rain), a picture of the sun (or use the paper sun from the sequencing cards), gardening gloves, a toy rake, and real or plastic flowers (to represent the colorful garden).